The Belgium national rugby union team represents Belgium in international rugby competitions. 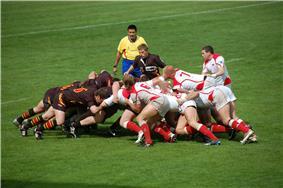 Rugby union in Belgium is administered by the Belgian Rugby Federation. Belgium have been ranked in the Top 30 since 2010. Belgium have yet to qualify for the Rugby World Cup. Belgium participates in the European Nations Cup (the second tier of European International competitions, the Six Nations being the most important one). The Belgium rugby team played their first match on 13 March 1932 against the Netherlands. They contested annual games against the Netherlands for half a decade starting in 1932. They drew the 1932 game, but lost subsequent matches during the 1930s. They also played Italy and Germany in 1937, losing both games. During the 1950s, Belgium continued playing the Netherlands, as well as teams like Spain. They managed to obtain a draw in the 1960s against Portugal. In the 1970s they won the majority of their games, as well as playing a broader range of European nations. This trend continued throughout the 1980s. Belgium had a six-game winning streak in the late 1980s. They began playing more games against their regular European opponents as they entered the 1990s. 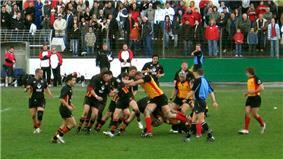 A Belgium side played the Argentina national rugby union team prior to the 2007 Rugby World Cup. A Belgium XV played the Barbarians on 24 May 2008. Belgium has been steadily improving, ranked number 55th in 2004, the 'Black Devils' improved a whole lot on the following years, obtaining good results against other European Nations, gaining entry to the IRB Ranking's Top 30 in 2010. Since their induction to the first 30 rugby nations in the international ranking, they have managed to maintain their place. Belgium had a very successful campaign during the 2010-2012 European Nations Cup, with a 10 match winning streak from March 2011 to December 2012. They gained promotion to the ENC 1A for the 2012-14 competition, where they play against sides such as Spain, Portugal, and the latest 2011 Rugby World Cup participants, Romania, Georgia and Russia. Jacques Rogge, the current International Olympic Committee president, was a member of the Belgium national team. 2003 - Did not qualify. Finished last in 2001 Round 2 Pool B. 2007 - Did not qualify. Finished second behind Germany in 2005-06 Round 3A. 2011 - Did not qualify. Finished second behind Ukraine in 2008-2010 ENC 2A. 2015 - Did not qualify. Players used in the 2010-2012 ENC. The following table shows Belgium's results over the past three years.